 VALUE TRIPLED - With 50 LED ! WE TRIPLE YOUR MONEY ! 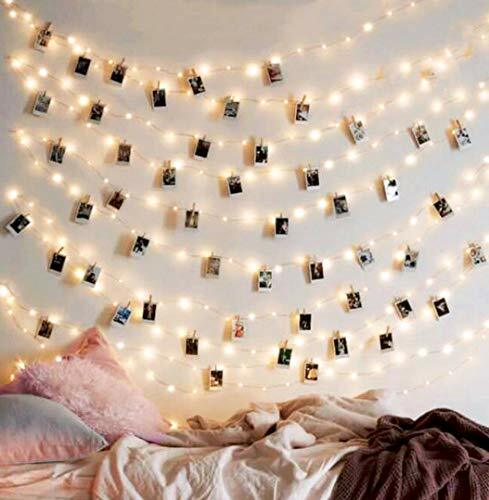 Our new model of string lights with clips ain't just hanging pictures with string / photo lights with clips, you can choose it as room lights decor string or use it as picture lights with our special-made photo clips !  WHAT OTHERS CAN'T - 5M/50LED is more than a double to models ! It allows you to adjust or add clothes pins for pictures FREELY on the silver picture string of any sizes, any picture anyway you want it ! You can put up polaroid pictures or cards on walls in your room, windows as a ROMANTIC SETTING etc.  SWEET VALENTINE - With multiple functions, it is NOT ONLY a perfect string lights for bedroom, It is ALSO an outdoor or indoor string lights decoration without the photo pins. Make your own unique light decoration such as PUT IT IN A JAR / FLOWER or photo display for your bedroom as a NICE VALENTINE's DAY DECOR !  UPGRADE - Longer LED string, multiple usages gives you UNLIMITED ideas! 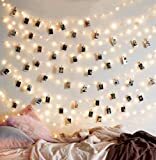 It is perfect as birthday gift, Christmas gift, for wedding, gift for teens for their bedroom decor, lights with clips for pictures and. It's always a suitable gift to anyone for bedroom decoration，lawn decoration, Valentine's Day, banquet, propose, surprise party etc.! ⚠️ PACKAGE - 100% MONEY BACK POLICY FOR ANY REASON ! PLUS A FREE E-Book on decoration !